Under pressure, the Labour council has retreated from the closure of one care home - but shamefully voted to close another, Glen Lee, despite opposition from care workers' unions Unison and Unite. Others came to protest against the introduction of parking charges for disabled drivers. With the Tory government's survival in doubt, why would any council take the axe to cut vital services now? Schools are in crisis as a result of Tory government funding cuts. A young school pupil, Adam, aged ten and chair of his school council, spoke in front of the entire council. He appealed for them to stop the cuts to his school. At a recent public meeting, Valentine Primary's National Education Union rep said everyone in the school was working to the limit, and the loss of any staff would make meeting the children's needs impossible. Teachers have now voted by 100% to strike against job cuts. They have the Socialist Party's full support. These cuts mean larger class sizes, cutting subjects like art and music, and losing teaching assistants and admin staff. 12 Southampton schools are in budget deficit. Those that aren't have made cuts to balance their budgets. The total deficit stands at over £4 million. But this is just 2% of the council's £192 million budget! It's the equivalent of a chocolate bar in a family's weekly shopping. Can't the city council find that from its reserves to protect school budgets? Central government has cut £136 million from the city's funding since 2010. In response, the council has cut 1,000 jobs. Yet we are paying higher and higher council tax bills for less and less services. Councillors say there is little they can do. But that's a total cop out. When councillors closed Oaklands Pool in 2012, they said they had no money. But then they found £1.5 million to refurbish it instead - in response to the massive support the campaign built. Last year, the council underspent by £2 million, and increased its reserves by £4 million. Why isn't this money, our money, used to stop cuts to school budgets and the closure of Glen Lee care home? Coxford's rebel anti-cuts councillors, Keith Morrell and Don Thomas, presented a no-cuts council budget to Southampton council in February 2013. This showed how the council could use its reserves and borrowing powers to set a no-cuts budget to protect jobs and services. Such a stand by Southampton council today, against a minority Tory government on the brink of collapse, would attract mass support from council workers and their unions, and across the city, if linked to building a campaign to demand the restoration of government funding. 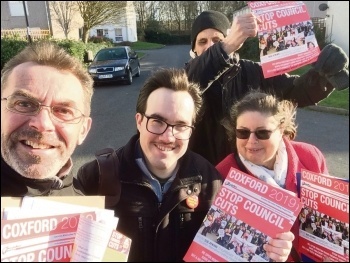 The by-election in Coxford on Thursday 14 March is an important opportunity to build on the campaigning work of Coxford councillors Keith, Don and Tammy Thomas, and the community which has worked with them to stop cuts to vital services. If you agree with the stand taken by Keith Morrell and the successful campaigning work he helped to lead, then join us and get active building support for the fight to stop council cuts now.